Statistics show a great disparity in educational attainment within the local area but for many young people the idea of continuing to further academic or vocational education is still out of reach. We aim to help to foster a culture of successful school completion and further education, alongside relevant statutory and community agencies, so that young people reach their full potential and in particular, to nurture and encourage interest in construction and health-related careers. Briefing sessions with schools, colleges and local training centres in the catchment area have commenced in relation to construction industry careers and future job opportunities within the health/life science area, with the delivery of more information workshops and educational programmes planned for the months ahead. 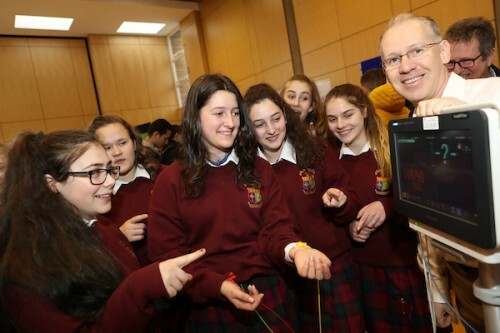 An example of this is ‘Engineering in a Box’, an educational initiative developed by STEAM in Cork to encourage young people’s interest in engineering. A group of NPHDB Engineers are volunteering to deliver this 10 week programme in 2 local primary schools in spring 2017. 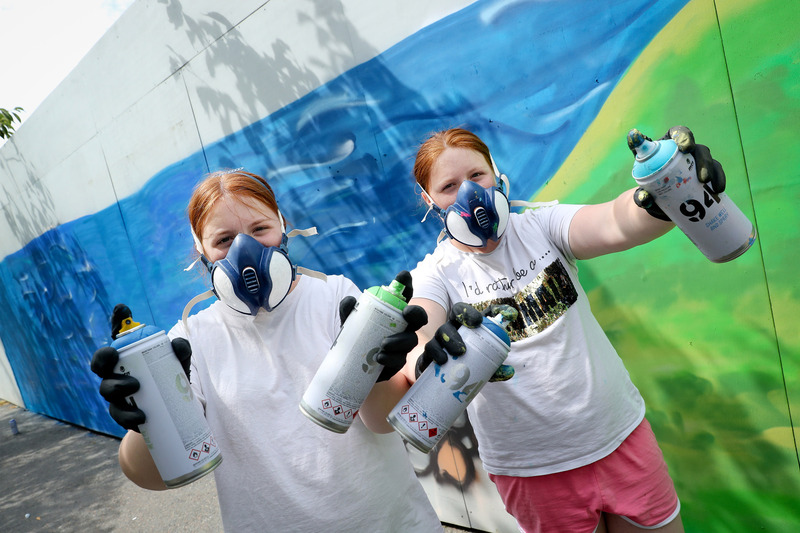 Local Young people make their mark on hoarding art project at site of new children’s hospital. Pictured from left to right are Sisters Kelsey and Shannon Redmond. Children and young people from Dublin 8 are taking part in an art project that will see a section of the hoarding erected around the new children’s hospital transformed to a design of their creation. A group from the Rialto Youth Project were the first local group to work on the hoarding, under the expert tutelage of street artists Emmalene Blake, Gordon Rice and Lanni Power who are training them in the specialist techniques of street art. A group from the Rialto Youth Project were the first local group to work on the hoarding, under the expert tutelage of street artists Emmalene Blake, Gordon Rice and Lanni Power who are training them in the specialist techniques of street art. Located across from the Rialto Luas Station, a 60-metre section of hoarding that now surrounds the construction site will be illustrated by the local children over the next number of weeks and will remain in place for the duration of the 4-year construction of the new children’s hospital. This is the latest initiative by the National Paediatric Hospital Development Board to involve the local community in the development of the hospital. Ingrid McElroy, Community Benefit Programme Manager said; “The NPHDB are committed to ensuring that the new children’s hospital is a good neighbour and that the local community benefits from its location in their area. The hoarding around the construction site will be in place for the next four years. As well as showing images of what the new hospital will look like, we wanted the local community to have an input its design. You can add your input and submit ideas to the design team via the design stage ENGAGE initiative.